Questions for the Man Who Wrote the Book. One of the new things I’m going to be doing is interviewing other people than Kelly about what advice they would give new EMTs and students. The first such interview is going to be with the man who literally wrote the book on Paramedic Care, Dr. Bryan Bledsoe. His five volume opus, Paramedic Care: Principles & Practice Vols 1-5 PKG is the core text book for my whole Paramedic Program. Of course right now we are also using Prehospital Emergency Pharmacology (6th Edition) which he also co-wrote. Oh and he wrote SUCCESS! for the Critical Care Paramedic with some Cajun guy you might know. As Kelly put it, Dr Bledsoe is as close to being a Rock Star of EMS as you get. A paramedic and now Doctor of Emergency Medicine and instructor at UNLV Medical School. This guys knows his stuff. Here’s what I need from you dear listeners, What questions do you have for Dr Bledsoe? Leave them in the comments below. You have until Sept 20 to get your questions in. I would like to know more about high flow oxygen and an uncomplicated MI. I have a few: ipatropium and peanut allergies our paramedic school says we can’t give it if they have peanut allergies. Isn’t it just the hand held atrovent that used to have a propellant that was bad for peanut allergies? What’s this I hear about O2 being bad? And could “oxygen free radicals” and their damage be made worse by careless O2 administering? Also I’d love to hear what our doctor friend thinks of paramedics (at the current skill level or otherwise) staffing clinics or mobile clinics in the field as the primary clinician? Love the show guys. 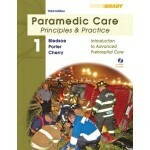 I enjoyed the EMT B stuff and as a paramedic student in my last 2 semesters I can’t wait to hear the ALS stuff!!! I’m studying for the NREMT-B exam and thought I would pull out an older (1991) version of Dr. Bledsoe’s “Paramedic Emergency Care” that I had on-hand to try to get a better grasp on alpha & beta medications. I was shocked to find that 1) there are 400+ more pages in the current EMT-B text, and 2) it’s pretty bare-bones! I’d be interested in his perspective concerning the evolution of the textbooks in recent years. Since the newer students seem to be getting a more in-depth education, does that make them better medics? How do the EMT’s who received their educations from the older textbooks comparing and/or compensating in the field? Is it true Byron Bledson was a yankee? What do the very best paramedics do differently than everyone else? Do you think there is still a place for Lasix in the prehospital environment? It doesn’t provide the immediate results we’re looking for (which nitro does) and is given inappropriately so often that I’m feeling the risks and harms far outweigh the benefit. In a perfect world, how would you design an EMS agency to provide expeditious responses and have appropriate resource management? The service I work for is exclusively ALS ambulances. Call 911, request EMS, you get an ALS ambulance. Cop requests EMS to “check out” a pregnant female involved in a minor car wreck, an ALS ambulance is sent. Call EMS because you don’t know how to work your glucometer, you get an ALS ambulance…etc. It seems to me that considering that some reasonable percentage of our calls are non-transports, we should provide a similar ratio of transport to non-transport response vehicles, but we don’t. Should EMS be exclusively ALS ambulance response? What about paramedic fly cars? BLS ambulances with ALS intercept? BLS fly cars to handle lift assists, glucometer checks, public education?